Open Shifts don't have a team member assigned to them. You can use Open Shifts to create templates that represent your ideal shift coverage or have team members schedule themselves. When open shifts are published, team members can pick them up from their schedules. To create an open shift, go to the Schedule => Team Schedule page and click on a cell in the Open Shift row. You should see a new shift pop-up like the one below. For more options, click on the Open Shift Tab tab. You can create multiple open shifts by editing the number of shift slots. 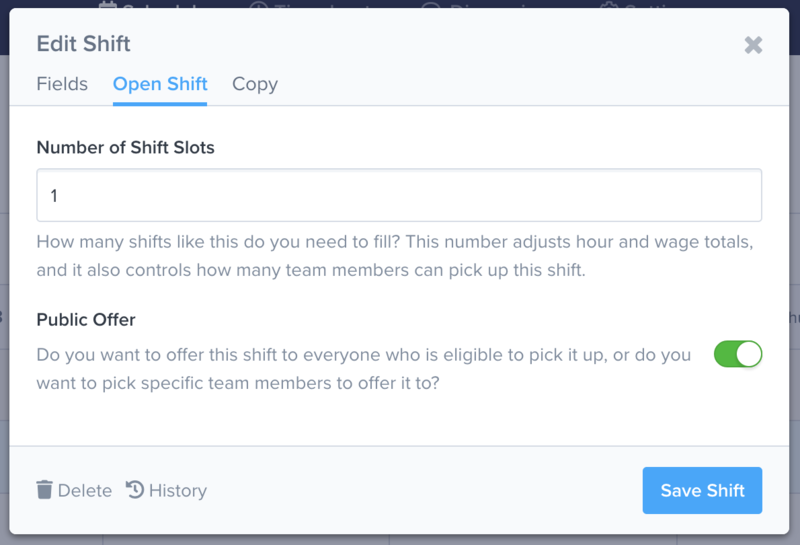 By default, open shifts are available to pickup by team members with assigned to the shift's position and location. You can choose who you would like the shift(s) to be available to by toggling the Public Offer option and choosing team members.